The iPF-670 is the ideal wide format printing / plotting solution for K-12 schools, small companies, and professionals, such as engineers, architects, and construction companies. The experienced support staff at ImageTech can help you find the best large format printing solution: 510.238.8905. Bayinkjet, our wide format printer online portal, offers the Canon iPF-670 at very competitive prices. The Canon imagePROGRAF iPF670 MFP L24, large format imaging system is an affordable scan-to-copy/file system for low volume and entry-level users. With a 24 inch scanner, this MFP is designed for architects, engineers, consulting firms, small offices and K-12 schools that require a minimal learning curve when it comes to new equipment. Suitable for K-12 schools, this inexpensive model makes it possible for schools to purchase an MFP that was once too expensive to afford. Schools can now create and print professional posters quickly and easily at a fraction of what it would cost to outsource. This is the perfect system for those who do not require the advanced functionality of the MFP M40 imaging system. 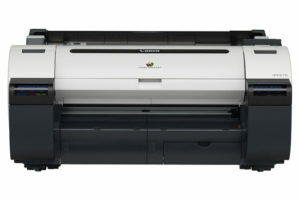 The new L series compliments the current MFP M40 product line by providing a product that offers basic scan-to-copy capabilities at an affordable price. Not just offering scan-to-copy, this imaging system also gives you the ability to scan to USB, scan to your PC as well as reduce and enlarge images. With three different quality modes available, you can choose Draft, Standard or Best mode based on the scan/print you are making. The iPF670 system comes available with user-friendly software solutions ready to meet your printing needs. Direct Print & Share, Canon’s cloud portal solution1 and batch printing software, is available as a download and allows for files to be uploaded, downloaded, shared and printed from almost anywhere in the world! Also downloadable is a mobile printing app, imagePROGRAF Print Utility2, which allows for PDFs as well as JPEGs and PNGs to be printed through use of an Apple® iPad®. The Accounting Manager software (PC only) allows you to track job costs, while the Print Plug-in for Microsoft® Office enables for documents created with Word®, Excel® or PowerPoint® to be easily printed in large format. Creating custom signage has never been easier with Canon’s included PosterArtist Lite poster creation software, this easy-to-use software will have you creating professional large format prints quickly in just four easy to follow steps. Refurbished Mimaki Large Format Printer Year-End Blow-Out! For only two weeks –ending December 28, 2017– ImageTech and Bayinkjet are offering very low prices on fully refurbished wide format Mimaki printers that were used at trade shows and/or demonstrations. All units include a 6 month limited warranty! Quantities are limited, will be sold on a first come, first served basis, and vary between the different models. Purchased Mimaki printers must ship on December 29, 2017. As of this writing, refurbished and demo Mimaki printers available include the CF2-1215TD, CG-130FXII, CJV-150-107, CJV-300-160, JFX200-2513, JV150-160, JV400-160LX, and UJF-3042-MkII. Call today for details on these deeply discounted Mimaki large format printers: (510) 238-8905.